Anna Tarca (Italy, 1985) graduated in Operatic Singing at the National Conservatory of Music “A. Steffani” in Castelfranco Veneto (TV), near Venice. She is now studying bel canto technique under the guidance of M° Sherman Lowe, and with soprano Laura Antonaz for Baroque and Ancient Music repertoire. As a soloist she has performed many concerts in different venues and festivals, such as in Venice: Le Sale Apollinee of La Fenice Theatre, S. Giovanni Evangelista Ancient Music Season, Gaetano Callido International Festival; and also abroad in Germany at the Heiliggeistkirche in Heidelberg, in Slovenia and in Croatia, under the conduction of Georg Grun, Nicol Matt, Gary Graden, Lorenzo Donati, and others. 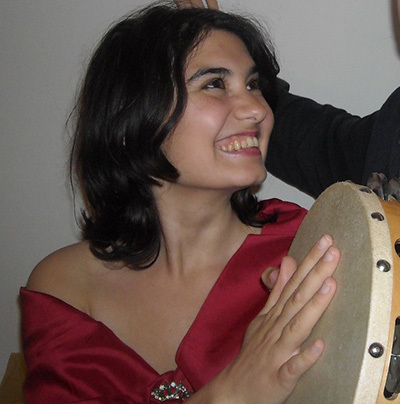 She has attended International Masterclasses at the Academy of Ancient Music in Bruneck and International Masterclasses of Musical Interpretation “Amiata in Musica”, as well as other masterclasses with various teachers. In the summer of 2015 she won a scholarship to attend the Orthodox Summer School at the International Orthodox Academy in Saint Petersburg (Russia). She also takes part in musicals, short films and theatrical performances. She has a particular interest in Neapolitan Folk Repertoire and has created a well-appreciated show the History of Neapolitan Folk Music. As a choral singer, she has a worked in a range of musical genres from Renaissance to Romantic Period and Opera to Contemporary and Folk Music: she is a regular member of the Chamber Choir of Europe, of the Italian Youth Choir and of Ut Insieme Vocale Consonante, and has also sung at the Cappella of Sankt Mark’s Basilica of Venice for many years. She has taken part in many CD recordings, among others in Stabat Mater by Angelo Comisso with Markus Stockhausen. Besides her artistic activities she is also active in teaching singing and music theory both in private and in state schools, and she regularly runs vocal courses for choirs. In particular she is the vocal coach and vice-conductor at the Cathedral Chorale in Treviso. Anna graduated with honours in Foreign Languages and Literatures at the Ca’ Foscari University of Venice, with a Masters thesis titled Music as a diplomatic instrument.